Hacienda Encantada Resort in Cabo San Lucas, Mexico, is a great option for an easy family beach vacation. It’s conveniently located 25 minutes from the international airport in a secluded position with spectacular views of the Sea of Cortez, yet only 10 minutes from the bustling downtown and Cabo Marina. The resort embraces the desert-meet-ocean setting and offers both all-suite rooms and residences. At Hacienda Encantada, the service is warm and welcoming. This 150-room all-suite property is perfect for families of all sizes as there are many connecting options with kitchen facilities. I stayed in a Master Suite with a bedroom with a king bed and a day bed, connected to a dining and living room with a sofa bed. The decor of the hacienda-style suites is comfortable and inviting. It combines Mexican architecture with modern amenities such as stainless appliances in the kitchen, rain showers in the bathrooms, and bath products made with local, organic ingredients. Spacious and private balconies have amazing views. 85 percent of the suites have ocean views, the remaining have garden or pool views. The brand new Residences at Hacienda Encantada are a five-minute walk or golf cart ride from the main resort and offer luxurious three-bedroom villas with a private pool, hot tub, fire pit and my favorite, a hammock to lay back and soak in the fabulous views. The interior designer is a member of the resort family. It’s obvious this is a labor of love. The stunning decor and personal touches make these villas a very special home-away-from-home. There are many choices at Hacienda Encantada, from casual to fine dining. For casual dining, the family favorite is the outdoor Taco Bar featuring live music every night. Parents can enjoy the cocktail-of-the-day and kids can dance on the large grassy area while waiting for the food. The friendly bartenders also give lessons on how to make speciality cocktails. For fine dining, nothing tops sitting on the terrace at Los Riscos Grill watching the glorious sunset and listening to the waves crashing on the beach. Kids are welcome at all the restaurants, but babysitting service is available if parents want to have a date night. Guests who prefer not to cook on vacation should consider the optional all-inclusive plan, which includes beverages and features a Dine Out Privilege that allows guests to dine at certain restaurants at the Golden Zone Marina. The resort shuttle runs to the Golden Zone Marina (10-15 minute ride) every two hours. For grocery shopping, there is a Sam’s Club a short drive away or families can request to have the refrigerator stocked prior to arrival. Forget something? There’s a great little market on property that carries a little of everything from milk to swim diapers. The biggest family decision each day is which pool to visit. Adults may vote for the beautiful infinity pool with breathtaking views and a swim-up bar. The youngest members of the family will most certainly want to lounge in the kid-sized chairs at the kids’ pool and play area with huge chess and bowling games. Teens may want to go to the Activity Pool for volleyball, or participate in a foosball and ping pong tournament. There’s also a small spa offering face, body, and nail treatments. With all there is to do at the resort, guests may never want to leave, but there are many fun excursions nearby. Swimming with the dolphins at Cabo Adventures is a must-do activity! A variety of snorkeling tours leave from the Cabo San Lucas marina. I took a breakfast tour with Cabo Escape Tours to Santa Maria and spent about an hour in the bay. During the cruise, guests get a great coastal tour and an awesome photo op of the Arches. While the snorkeling is fun, the variety of fish is not the same as Hawaii or the Caribbean. Keep in mind that the water temperature starts to drop in January and continues to cool until June. Families can also join a kayaking tour, take a ride on a glass bottomed boat, go parasailing or take a surfing lesson. The beach at Hacienda Encantada is not swimmable due to strong currents, but guests have several swimmable beach options nearby. The hotel offers a shuttle to Hacienda Encantada’s sister property, Marina Fiesta Resort, a five-minute walk to Medano beach, one of the most famous beaches in Cabo. Another option is to take a boat from the marina to Lover’s Beach, or guests with a car can drive from Hacienda Encantada to Santa Maria beach. We were sad to say goodbye to Hacienda Encantada. Families do not have to speak Spanish here, but it is fun to learn a few words and bring home some Pesos as a memento of a visit to sunny Cabo! Want Help Booking a Room at Hacienda Encantada Resort or Planning a Family Vacation to Mexico? We can help! Click the Check Availability button on the Hacienda Encantada Resort in the CB! Hotel Collection. 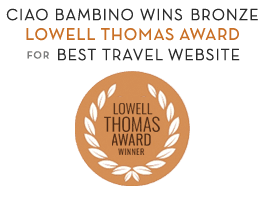 If you make a request using Ciao Bambino, the request goes right to the hotel for the best available pricing and then one of our Family Vacation Consultants will follow up with you to help with your booking. This is a free service! Or, request full itinerary planning assistance for travel to Mexico with kids on My Trip Planner. Editor’s Note: Sandy participated in a media trip to Hacienda Encontada and received complimentary accommodations. As always, our opinions are our own on Ciao Bambino. Photos by Sandy Pappas.